With our close relationships with many of Sydney’s leading venues, and a passionate team who know the liquor supply and corporate worlds inside out, you can rely on Shorty’s to help you make your next event absolutely legendary. Whether you are hosting your event at your home, at the office, or even on a boat, Shorty’s doesn’t stop at being your trusted supplier of premium brand beverages. We are highly experienced with all types of functions, and can offer as much or as little help as you need to ensure that everyone has a good time – especially you! Finding the right venue or caterer and getting you a great deal on the booking. If food will be served, designing a tasteful drinks list to match your menu. Recommending the best brands and quantities to suit your budget. Calculating how much and what type of alcohol you should buy, based on things like guest numbers, type of party, and location. Whether you’ll need water, mixers, and non-alcoholic beverages for the non-drinkers, designated drivers and younger guests. Sourcing a special or hard-to-find Champagne, Grange or single malt Scotch to toast your VIP guests. 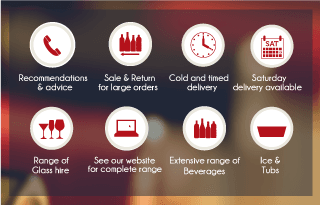 Delivering your beverages already chilled and ready to drink, and helping to set up your bar or drinks table. Providing function essentials for purchase and hire such as ice, ice tubs, glassware, chips, sweets, and other packaged snacks. Offering you the option to return up to 20% of your total purchase amount after your event, provided the products are unopened and undamaged (see our Returns Policy for more information). To ensure that you don’t end up with too much or not enough quantities, we strongly recommend that you speak to one Shorty’s friendly team members before ordering for your event. Expert beverage and function planning advice is only a phone call away on 1300 SHORTY (746 789). If you are ready to make your order, please click to download our Functions & Events Booking Form. Complete and email your form to orders@shortysliquor.com.au on the same day that you make your beverages order, so we know that the order is for an event. You can place your order either by calling us on 1300 SHORTY (746 789), by emailing your desired products and quantities to orders@shortysliquor.com.au, or by using website. We accept all major credit cards, bank deposit, and PayPal. To learn more about ordering and payment options, please give us a call. If you'd like ideas about what beverages to offer at your next event, please see Shorty's Party Planning Guide.